The capital of Portugal is completely riddled with history, amazing architecture, charming lanes, delicious food and lively atmosphere. Like much of the Iberian Peninsula it was under Moorish control for centuries and it’s left its mark in everything from place names to artwork. So with all the things to do here comes the agonising choice of what to do with your time in the city. But don’t worry. We’ve made life easier for you with a handy guide to the best things to do in Lisbon, whether you’re travelling as a couple or if you’re on a family holiday. Additional reading – 17 Stunning Hotels in Lisbon and Where to Stay in Lisbon [Neighbourhood Guide]. There’s more fun packed into Lisbon than you’d imagine. But for some definitely enjoyable things to do in Lisbon, finding a different way to experience the city’s sights is a cool way to have fun here. Soak up all the sights, sounds and flavours in Lisbon and travel around on a Segway. The ultimate in fun things to do in Lisbon, you’ll get to cruise along the city streets in search of snacks. Don’t worry: you’ll have a guide with you to point you in the right direction of interesting sights. You’ll get kitted up and taught how to use the Segway (important) and then off you go on your adventures. Travel through the old neighbourhood of Alfama, hit the charming lanes of Bairro Alto and then to the Tejo River. Along the way, there’ll be a chance to take breaks and taste the city’s culinary offerings. Chat with friendly locals as you choose some of the many mouthwatering pastries to sample, pick up a chorizo sandwich and sample the fried delight of peixinhos da horta. For a fun thing to do in Lisbon, hop in a GoCar. It’s sort of like driving around a city in a normal car, except the GoCar is a mini open-top three-wheeler which automatically makes it more fun. And not only do you get to zip around on Lisbon’s historic, pretty streets, but the GoCar itself comes with an advanced GPS system so you won’t get lost. So for fun things to do in Lisbon we can’t think of much better than zipping around the city and seeing the sights while you’re doing it! The GPS is also an audio guide too, so you won’t just be led to Lisbon’s grand buildings like the Principe Real Garden and Amalia Rodrigues Museum – you’ll get to learn about them too. So this one’s fun and educational, which is always a plus. Lisbon’s streets are overflowing with colourful artwork and intriguing murals; it’s easy to spend a day soaking up the city’s creative side, so take a tour around the streets to discover the amazing street art. Hunting down some of the best graffiti is a great way to see more of the local side of the city and one of the most fun things to do in Lisbon. A guide is a good idea: they’ll take you along unsuspecting alleyways where famous works are hiding and to large open public spaces to see huge pieces of urban art stretched across the side of apartment blocks. You’ll be able to see some sophisticated sculptures coming out the side of buildings, weird and wonderful paintings of lizards, plus hordes of poignant political paintings. Romance is never too far away in the Portuguese capital, what with all the delicious food, traditional culture and exquisite architecture. You’ll find there’s a lot of romantic things to do in Lisbon – here are a few of the best. A classic thing for couples to do is to watch a sunset. We can all agree on that. So easily one of the best romantic things to do in Lisbon is to watch a sunset, of course, but not only that: cruising along the Tagus as the sun sets elevates this activity to top levels of romance. First of all, seeing the city from the river is a different perspective altogether. The buildings along the waterfront are beautiful in the early evening light. You’ll get to see top sights usually hidden by the roofs of other buildings. There’s the Castle of São Jorge, perched on one of Lisbon’s hills, the beautiful white dome of the Basilica da Estrela, and – making your way back to town at dusk – the Cristo-Rei Statue. Lisbon is home to the very passionate and exciting Fado music, born out of the bars, cafes and back streets of the city. Seeing a Fado performance if you’re in the city is not only one of the most romantic things to do in Lisbon, but it’s a must for anyone who wants to discover the soul of the city. A cultural symbol of Portugal’s history and traditions, Fado is performed with singers and musicians. Spend an evening watching the expressive nature of the performers at the strum Portuguese and classical guitars and listen to singer’s tell tales of love and sadness. Fado is a nostalgic and proud music and the audience is often bound together in a world of mystery and emotions, so it’s no wonder UNESCO dedicated it an Intangible Cultural Heritage. You may not think that history is a very romantic subject, but when you throw in the charming streets and elegant buildings that come with it, then you can’t help but feel that it’s a romantic backdrop for your trip. So let you and your partner be whisked around the city on a tour (complete with knowledgeable guide) that will have you walking through the best areas that Lisbon has to offer. There’s the storied district of Bairro Alto, the lovely gardens at São Pedro de Alcântara, and Baixa – the centre of the city. Visiting stunning monuments like the Baroque style Jesuit church of San Roque and city’s cathedral, and sharing the sights together, makes this one of the most romantic things to do in Lisbon. Sometimes there’s nothing harder to decide what to do when you’re on holiday with your children. Where do you go? What things are child-friendly? Don’t worry. We’ve found some of the best things to do in Sydney with kids. Looking for things to do in Lisbon with kids? Take a trip Lisbon Oceanarium and spend the day together seeing all of the amazing sea creatures and learning about life beneath the waves. The aquarium is spread across a large area and is the biggest of its kind in Europe which means even on busy days, in the height of the tourist season, it never feels too crowded. Here you’ll be wowed by the incredible diversity of life living on our planet as you make your way through the four different areas divided into different oceans. Your children will be able to get up close to the 8,000 different creatures and 500 species that live in the aquarium, as well as preserving the habitat that is integral for a healthy planet. When you’re on holiday with your family one of your biggest priorities (probably) is trying to keep things as stress-free as possible. There’s nothing quite like hassle to make your trip less enjoyable when you’ve got children to juggle. Luckily in Portugal’s capital, you can make things super easy for you and your family by picking up a Lisbon Card. What’s that? It’s effectively a key to the city, providing access to a whopping 23 of the city’s museums and historic sites – oh, and unlimited use of Lisbon’s public transport! You can get them for one, two or three days (exact to the hour), really opening up the city for you and your family. A winner when it comes to things to do in Lisbon with kids in tow. Spend the day with your children pretending to be knights protecting your land at Sao Jorge Castle. Sat up on one of the hills overlooking the city, the medieval castle is a symbol of Lisbon and is packed full of amazing tales and fascinating history. A day adventuring inside the old walls of the castle is the perfect thing to do in Lisbon with kids. Start your journey into the past as you step through the inner gate and then cross the moat into the castle: watch out for the resident roaming peacocks that guard the castle. Inside, the castle is like a maze, which makes it an exciting place for kids who’ll have fun packed adventures rambling along the ramparts, dipping under stone archways and running along old passages. Just make sure to keep an eye for approaching enemy armies as you peer over the walls at the city below! If you’re backpacking to Lisbon, if you’re on a tight budget, or even if you just like the sound of a bargain, we’ve rounded up a few of the best free things to do in Lisbon to help you save money on your trip. There’s a lot of reasons why you might want to take a stroll down this landmark of a thoroughfare in Lisbon. First of all, it looks amazing: the tall sides of the grand buildings that line this pedestrianised street are a world to themselves. Secondly, it’s filled with shops so if you’re into window shopping then this is a great place for you to stroll along. There are also a lot of street performers down here making it a pretty entertaining (and sometimes odd) place. For the ambience alone along the Rua Augusta, simply wandering along it is one of the best free things to do in Lisbon. But the cherry on top comes at the end on Praça do Comércio. You’ll see the ornate and triumphant Rua Augusta Arch: it was built to commemorate the city being rebuilt after the 1755 earthquake. A trip to Feira da Ladra, which translates as Thief’s Market, is a must for anyone who loves old curios and vintage finds. The sprawling market is the oldest in the city and is said to have roots in the 12th century. A fun and friendly place, the market takes place twice a week is one of the most interesting free things to do in Lisbon. Traders lay out their goods on the ground on bits of fabrics and sell a whole range of clothes, books, antiques, furniture and handmade goods. It’s enjoyable to simply browse the stalls and see what strange items are on offer, who knows – you might just come across a real gem. Make sure you walk all the way into the market, past the Panteão Nacional to catch sight of an amazing view of the Alfama area and the Tagus River. The best views cost nothing, so you’ll be happy to know that you can get to see an amazing view of Lisbon from the church of Santa Luzia – one of the best free things to do in Lisbon. The church has a wide terrace which looks out over the impossibly picturesque Alfama area, with its white walls, red roofs and the blue of the Tagus River beyond. You can spend a while here, just staring out at it all and taking pictures. There are two pretty cool tiled murals up at Miradouro de Santa Luzia, too. On the south wall, there’s a depiction of Praça do Comércio before the earthquake as well as one that shows Christians attacking Sao Jorge Castle and winning back Lisbon. Think it’s too busy? Search for the other Miradouros (viewpoints) that dot the town. Lisbon might be an interesting city to explore during daylight hours, but it’s when night falls that the city really starts to come alive. Illuminated and full of electric energy, Lisbon’s plentiful bars brim with locals enjoying drinks together, restaurants serve up delicious delights and there are endless atmospheric musical performances to enjoy. 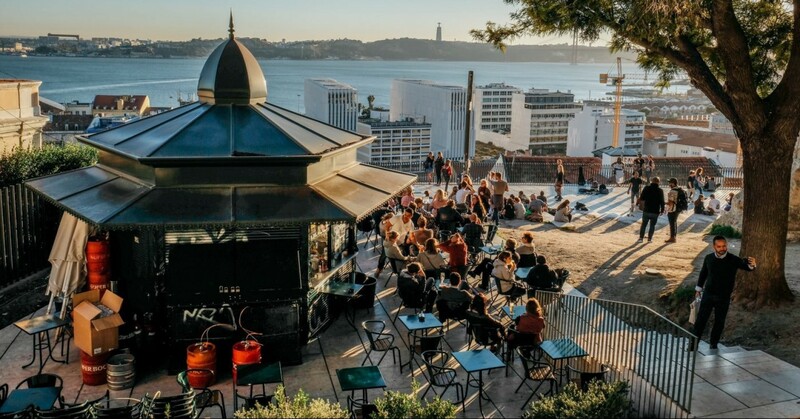 Lisbon is home to a very lively nightlife scene and there’s no better thing to do in Lisbon at night than to dive into the world of bars and restaurants that are packed into Bairro Alto. The eclectic mix of evening hangouts that line the cobbled streets of the district makes it the perfect place for anybody to enjoy a night out in the city. Chill out to the cool beats of funky DJs, drink in small caverns as you share tables with locals, and sample cocktails in themed bars. Start the night in by having a drink or two in Chinese themed Mahjong bar, which is actually the oldest bar in the district; listen to live jazz complemented by glasses of excellent wine in Artis; then get creative in Capela or hit the dancefloor in funky Frágil club. Just make sure your legs are ready for the steep old streets with their numerous steps! One of the best things to do at night in Lisbon, like in any city anywhere in the world, is to check out what it’s music scene is like. And a good place to do this is at Alface Hall. This famous little bar is a vintage lovers paradise in terms of its decor: the walls are decorated in old LP covers and retro cinema seats and marble-topped tables provide seating for the clientele. But it’s the atmosphere here that wins it the most points. It’s something of a local favourite, as well as popular with travellers who come for drinks and – of course – sampling the live music. If you come early to mid-week, you’ll be rewarded with blues; but if you’re there during the weekend, expect some lively jazz. Spend an evening in one of the most iconic buildings in the city at the Teatro Tivoli and watch a live performance of ballet or even catch a film screening. The theatre sits on the corner of the charming Avenida da Liberdade and dates back to 1924. After undergoing restoration in the 1990s, the theatre’s ornate Louis XIV style interiors were returned to their former glory and nowadays. And with its diverse performance schedule, watching a show here is of the theatre is one of the best things to do in Lisbon at night. That was our guide to the best things to do in Lisbon. From things to do if you happen to be on a budget, to family-friendly activities perfect if you’re on holiday with little ones, there’s bound to be something to suit you. And if you want to save money, it’s easy! Just head up to a viewpoint for an amazing vista across Lisbon, or simply pick a historic area and walk around it. Everything’s so charming here that you’ll be wandering for hours. So, what are you waiting for? Get booking your Lisbon trip and plan what you’re going to do in this fun city with the help of our guide to Lisbon’s top activities.